Arguably the most versatile fitting on the market, these rubber fittings serve a few applications. They can be flexible unlike other fittings, and come with hose clamps for easy and secure installation. Canarsee offers a wide variety of Flexible Rubber Couplings and Caps that work with PVC and threaded pipes. The 456007C from Matco-Norca is a 1-1/2” End Cap. It's used to cap off the end of a 1-1/2" cast iron.. The 4560706TD from Matco-Norca is a 1-1/2” Drain x 1-1/4” Tubular Flexible Rubber Coupling Adapter. .. 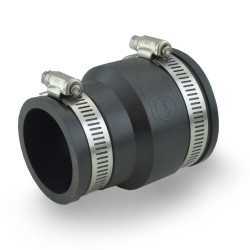 The 4560807TD from Matco-Norca is a 2” Drain x 1-1/2” Tubular Flexible Rubber Coupling Adapter. It's.. The 4560606 from Matco-Norca is a 1-1/4” Flexible Rubber Coupling. It's used to connect two 1-1/4" n.. The 4560808 from Matco-Norca is a 2” Flexible Rubber Coupling. It's used to connect two 2" no-hub ca.. The 4560706 from Matco-Norca is a 1-1/2” x 1-1/4” Flexible Rubber Coupling. It's used to connect 1-1.. The 4560707 from Matco-Norca is a 1-1/2” Flexible Rubber Coupling. It's used to connect two 1-1/2" n.. The 456010C from Matco-Norca is a 3” End Cap. It's used to cap off the end of a 3" cast iron no-hub .. The 4560807 from Matco-Norca is a 2” x 1-1/2” Flexible Rubber Coupling. It's used to connect 2" and .. The 4561008 from Matco-Norca is a 3” x 2” Flexible Rubber Coupling. It's used to connect 3" and 2” n.. This flexible rubber coupling is used to connect two 4" no-hub.. The 4561108 from Matco-Norca is a 4” x 2” Flexible Rubber Coupling. It's used to connect 4" and 2” n.. The 4561110 from Matco-Norca is a 4” x 3” Flexible Rubber Coupling. It's used to connect 4" and 3” n.. The 4561311 from Matco-Norca is a 6” x 4” Flexible Rubber Coupling. It's used to connect 6" and 4” n.. The 4561313 from Matco-Norca is a 6” Flexible Rubber Coupling. It's used to connect two 6" no-hub ca..